It's hard to imagine that anybody but the seriously demented could have seen Frank Muir and forget him. After all, to a foreigner like myself, he looks as British as "Sir" Alec Guiness (one wonders why Frank Muir was never knighted). But then there was his pink bowtie, which made him recognizable as Frank Muir (and definitely not as Alec Guiness). Before I ever saw Frank Muir I had for years enjoyed his wit - through the BBC World Service - in the program Upon My Word , and had become acquainted with his typical Frank Muir voice - which was as recognizable as his appearance. You will understand how delighted I was when the other day, I found a book named Upon My Word in which half of the stories were written by Frank Muir. 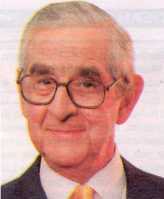 His partner in Upon My Word was Dennis Norden, who did not catch the eye (nor the ear) as much as Frank Muir did. But Dennis's stories were a revelation. When I was a teacher I found it difficult to explain the meaning of the word witty. In hindsight, I think I should have let them read a story by Dennis Norden - although I doubt whether, with their fart-and-belch-sense-of-humour, they would have been able to savour these subtle delicacies. All the stories in Upon My Word were based on the same principle: Frank and Dennis had to make up a story that ended in a given saying or quotation. The quotations, however, never came out the way you find them in your quotation book. Just to give a few examples: "Half a loaf is better than no bread" came out as "Half a love is better than no bride." And the French national anthem "Allons enfants de la patrie" became "Alonzo, fondle our pear tree!" Neville Pacefoot, the text-book example of what pop psychiatrists call 'a victim personality'. From early childhood, life treated him like the back wall of a squash court. Neville's first brush with calamity came during his Boy Scout days. While he was helping an old lady across a street they both got run over. After a three-hour operation, he was taken off the danger-list and they allowed him to sit up and look at his Get Well cards. The first one was so amusing, he burst out laughing and broke eight stitches. Opening the next one he cut his finger and developed blood-poisoning. Those were the earliest intimations that, in this supermarket we call Existence, Neville had grabbed the shopping-cart with the wonky wheel. At the outbreak of War he persuaded the RAF to accept him, despite the fact that two of his toes had been crushed shapeless. (By a falling First Aid Cabinet.) He immediately became the only serviceman to get wounded during his Preliminary Medical Examination. While the Medical Officer was sounding his chest, Neville noticed an Air Vice-Marshal entering the room, so he threw up a salute. It pulled the rubber tube of the stethoscope clean out of the M.O. 's head, and when the metal ear-pieces snapped back, that was the last of Neville's teeth. Nevertheless he persevered with the training and passed out as Sergeant Air Gunner. The stripes did not survive his first mission. He spent that whole trip to and from Hamburg with his face pressed against the fuselage, the result of having slammed his handle-bar moustache in the plane door just before take-off. Invalided out with a disability pension a few months later, having been run over by an ambulance, he was directed to agricultural work and spent six months on a farm before a cow fell on him. I lost touch with Neville for a while after the War, although I kept reading about him in such periodicals as the Journal Of The Road Accident Research Centre, whose cover he made four times. After he'd achieved national headlines as the first driver to break a leg by catching his foot in a car safety-belt, his insurance company wrote to ask for their calendar back. "It's like giving life cover to a lemming," the letter said. When you've read this fragment, you may not be converted, but at least you have some idea what is meant by the Yiddish word schlemiel (or schlemazl). After the completion of this weblog, I happened to take a look at the date. Yes, indeed: Friday the 13th. Do you still believe in coincidence?